I finally learned about link parties right before Christmas. Honestly, I think I OD'd on all the Christmas projects. So when Christmas was done with, I was excited to see more everyday projects, right? Well, there was a brief interlude where the Best of 2012 was all the rage. I wondered to myself, why didn't I think to do that? I had planned on a similar post for my one year anniversary. Well, now I know that is what you are supposed to post at the end of the year. Ok, so some everyday projects now? Yes, please! I guess it makes sense that you need to get your projects up prior to the holiday so that people have time to try them. I just wasn't in the mood. I watched January slipping by without a clue on what I was going to post for valentines. I had plans to do some Valentine jewelry the week before Valentines and maybe another DIY project. 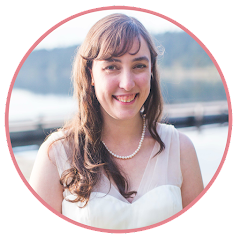 After reading Diana's Linky Party Tips, I realized I was very wrong in waiting. She states in her tips to follow the holiday trends, but do it early. That Valentine posts are hot NOW (January 16th) but will have cooled off once it is a week till. Well, better late than never, I decided to attempt a Valentine post just before January ends. Only, I wasn't feeling inspired at all. I just wasn't feeling it. I actually have been avoiding all the Valentine posts in link parties, only clicking on a few here and there. It probably helps that I don't have any children that I need to help prepare for Valentines. Otherwise I would be scrambling for something cute and clever and in turn, probably loving all the clever ideas out there. I started thinking about my normal Valentines. Growing up, I always gave my mom Valentines. She was my special Valentine. When I got older, I would bring her flowers and a card for Valentines Day. This was my job as my dad was a typical guy (hopeless). Last year, my fiancé brought me flowers to work! It was shocking. I had never had anything like this performed for me. My coworkers flocked around my desk to check out the flowers. He is such a sweetie! I got really into pom poms after my Finger Knit Garland with Pom Poms. Every time I saw pom poms shared in a link party, I immediately jumped to it. 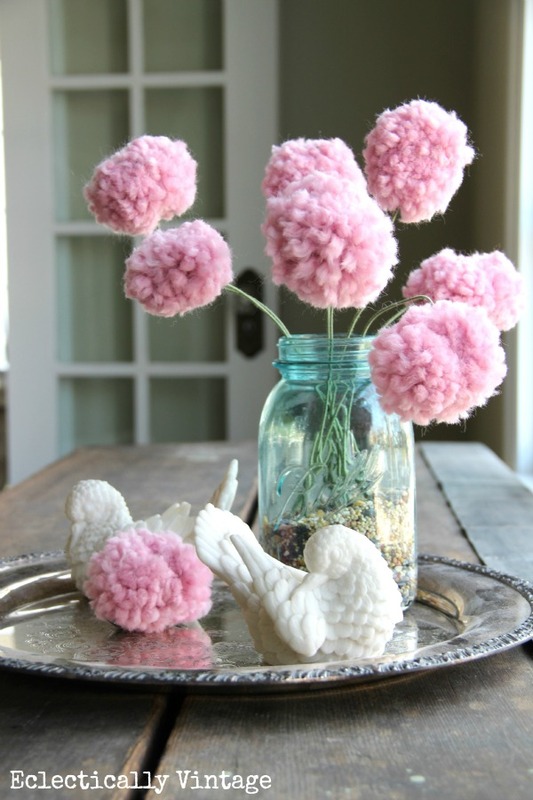 That is how I came across Kelly's Pom Pom Bouquet. I knew I wanted to try these, so I pinned them to my Pinterest board for later. Well, my self-imposed deadline for a Valentine's project fast approached and I still had nothing the day before. I didn't have any red yarn on hand to attempt some yarn pom pom roses, so I started exploring Pinterest and this is what I came up with. An old cutting board (ignore my ugly one in the background of all my photos! 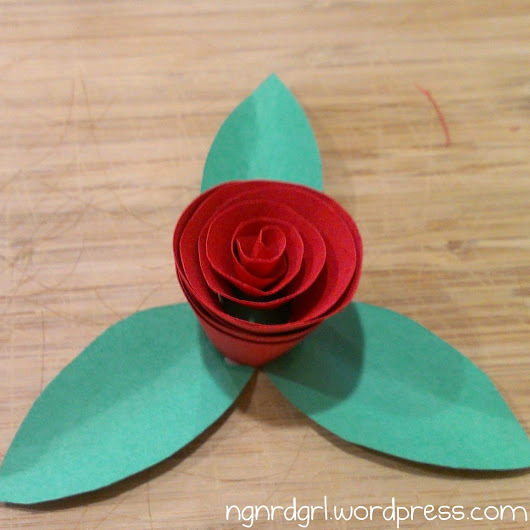 ), corrugated cardboard or a self-healing cutting mat for cutting out your rose petals. 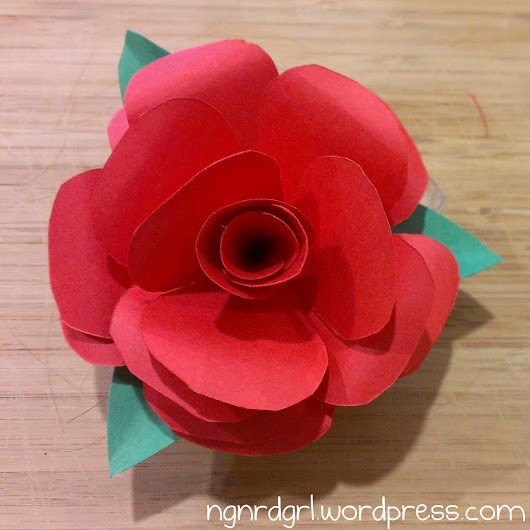 For this paper flower, you need to download Ellinee's Paper Rose Template. I used the white rose template and printed it out on computer paper. I taped the template to my red construction paper and used an exacto blade to cut out the petals. I then taped it to the green construction paper to cut out the leaves. The petals and leaves are numbered in the order that they are constructed, so you will want to keep your printer paper shapes with the construction paper until you are ready to set them up. My step by step pictures turned out horrible, so I am just going to point you to Ellinee's tutorial on how to construct them. I think I wound the inner petals too tightly, but over all I think this one is my favorite. The steps are super easy, but time-consuming. If you wanted to make a ton of these, I would suggest a Silhouette Cameo to cut out card stock for you. These would make a fabulous eternal wedding bouquet. A hot glue gun is an absolute must! I learned this very quickly. Can you believe I don't own a hot glue gun? I'm going to have to remedy this pronto! This one looked super simple but actually turned out harder than I thought. It kept trying to unravel on me and shoot out like those Chinese yoyo's we used to play with as kids. It also turned out to be my least favorite. I have seen these all over Pinterest, so I had to try them at least once. In the future, I would just rather skip this one and go straight to the petal rose above. Again, my step by step pictures did not turn out well at all. I used my point and shoot to take step by step pictures because I have a tripod for it, but then took final pictures with my camera phone. Lets just say the pictures turned out night and day! Because of this, I'm just going to point you to Tammy's picture tutorial. Unfortunately, she doesn't share how she adhered her roses. I used some double-sided tape, but I'm sure hot glue would work better. Also, you need to make sure to wind it tightly. It is going to try to unravel on you quickly. Glue as you go to avoid it shooting out at you like a Chinese yoyo (mine seriously did this to me). My Pinspiration came from Tammy's Life in Pictures DiY Paper Flowers picture tutorial. I ended up stealing the leaf template from Ellinee's Paper Rose Template to make leaves for this rose and my pom pom rose below. 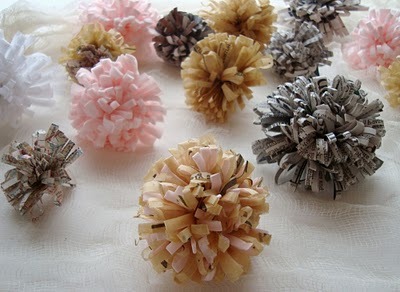 Since my original inspiration was a yarn pom pom bouquet, I couldn't pass this super cute paper pom pom tutorial. Even though it really isn't a rose, I had to try it. I was skeptical at first that this would turn out good using construction paper. The original tutorial by Maya used wrapping paper, tissue paper and what looks like tracing paper from an old sewing pattern. I love how she encourages using pieces of paper that you would normally have recycled. Well, construction paper turned out just fine. This one was by far the easiest of the three. I used just plain old scissors and was done lickity split. I even tore the paper stem a bit but just kept going and it still looked great. I can really see doing this again with coordinating wrapping paper for sprucing up a gift. I finished it off with a small piece of double-sided tape, then glued it to the another leaf from the petal rose template. To take this one step further I would have made stems for them. I would have used floral wire and tape. I didn't have these on hand, so I skipped this step. 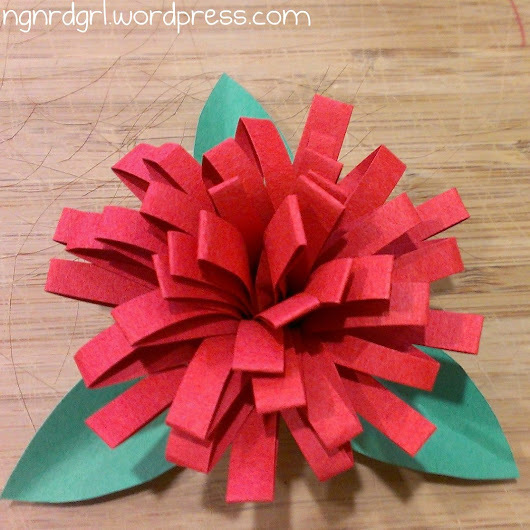 I thought about trying to make stems from construction paper, but since I didn't have a hot glue gun, I didn't even try to attempt this with white school glue. What do you think of my paper roses? They turned out pretty good compared to my pinspirations? huh? Which one do you like the best? I'm leaning towards the petal rose in first, pom pom flowers in second and the spiral rose third. I love these.. I tried to make these years ago but needless to say they turned out rather awful.. i shall give these another go using your amazing directions and let you know how they turn out.. Thank you! You will have to report back which one you tried and how it went. I hung onto every word in this post because I can wholeheartedly relate to so much of what you mention: getting a little bit overdosed on the Christmas crafts only to find that after Christmas, it's best-of posts followed by Valentine's Day! And I have a V-Day post planned for a few days before V-Day - - oops! Now I'll know for next year to share those V-Day crafts in January! Guess that's part of the learning curve, right? By the by, your paper flowers turned out fabulously; looks like you mastered each different type! 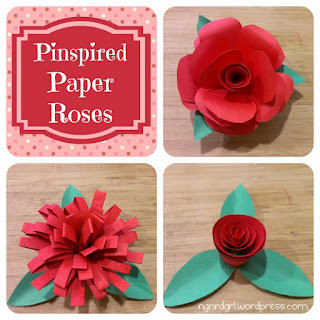 I think my favorite is the petal rose, as well...it just looks so profesh! Wow, your paper roses look absolutely smashing! I think that the small one is the best, just waiting to bloom! These turned out great! Very cute and well explained! Linking up via The Pinspiration Project! These are great! I'm so glad you shared them. I found you through the Fun in Functional Link Party. Thanks for the inspiration!! Thank you! They were fun to make. Thank you! I really like the side by side with my inspiration. I think they turned out so good! Thank you for dropping by! Thank you for dropping by! They were fun to make. Thank you! I'm headed to your site to check it out. Thanks for the invite! I am loving these! Sooo cute! Thanks for sharing! Loved having you stop by my blog earlier! Thank you for visiting me back! Thanks for linking up! I hope to see you Thursday! Very pretty Bethany!! Thanks for linking up at my Pin Me Linky Party. these will be fun to try with my granddaughter. Please share your favorite jewelry collection shop or link from where you purchase. I found many shop but I like from that traditional jewellery India. One necklaces i try and that was soo classy.